This event was Five Star’s first event in Bardstown, KY this season. The “My Old Kentucky Hom Invitation was hosted at Nichols County High School. 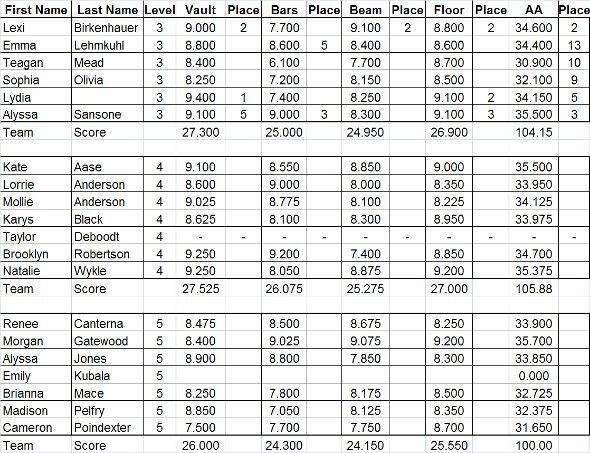 The level four team had a reasonable showing with Brooklyn landing a 1st place finish in the bars and Natalie taking a 3rd place finish in the floor routine. Kate had the level 4 high overall score with a 35.5. This meet was particularly tough because their were eighteen girls classified in the 9 year old bracket.